Most people already know that Bitcoins are created through the process of mining. But what is Bitcoin mining and how does it work? Bitcoin mining is a process of confirming Bitcoin transactions and recording them on a distributed ledger. It is the most important procedure of the entire Bitcoin network, as it secures the system, ensures that everyone is acting justly, and introduces new Bitcoins into the circulation. Of course, no mining would take place without miners. Miners all over the world keep the network decentralized by deploying their hardware and electricity in order to participate in the system. In turn, they are rewarded with transaction fees and freshly minted Bitcoins. 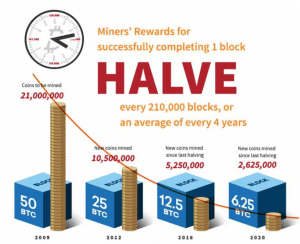 These rewards incentivize the miners to do the work and cover their expenses. Although this is a gross simplification, such a system of incentives makes up the Bitcoin network. - Miners set up their hardware to verify Bitcoin network transactions. - Verified transactions are bundled into a single 1 MB size block every 10 minutes. - All network computers must solve a complicated cryptographic puzzle to add a new block to the Bitcoin blockchain. - The first computer that solves the puzzle adds the block and is rewarded with Bitcoins. Currently, once a puzzle is solved, and a new block added to the blockchain, the miner gets a bounty of 12.5 Bitcoins. The prize is decreasing over time – it shrinks by half every 210,000 blocks. The first miners had earned 50 Bitcoins per block, while in 2020 the rate will drop to 6.25 Bitcoins. You can use sites like Bitcoin Clock to keep track of the Bitcoin halving events. Keep in mind there will be no more than 21,000,000 BTC created. The artificial limit is necessary to keep the Bitcoin economic system deflationary. 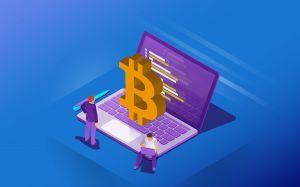 As of now, the newly minted Bitcoins act as an incentive for the miners to maintain the network, but and the amount is set to gradually decrease until all 21 million BTC are mined. 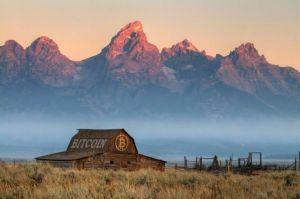 Mining can be highly profitable, especially as Bitcoin continues to appreciate in value. Miners also earn user fees paid for their transactions. However, sometimes they may not receive any reward at all, as only the first miner who solves the puzzle collects the prize. Such a system encourages miners to form joint mining rigs (farms) where all members share the same block reward, thus increasing their profitability. In 2025, 95% of all Bitcoins will be mined, while the rest will enter the market by 2140. After that time, the miners will get only the transactions fees as a reward, but that should be a large enough reward to keep the network going. Bitcoin is a fully open-source project; thus, everyone is free to join the Bitcoin network and partake in mining. However, that doesn’t guarantee you a profit, as you have to buy special mining gear and pay electricity bills that can be costly. In order to make money with Bitcoin mining, you should purchase extremely powerful computers (know as ASICs), invest in cooling gear and storage. Due to the tight competition between the miners, it’s impossible to mine with a simple PC or GPU in home conditions. You can figure out how much you can gain by using a Bitcoin mining calculator; many are available online. You can also pay a company with rigs to mine Bitcoin for you. You sign a contract which makes you pay them for around two years of mining, and receive periodic payouts of coins, as per agreement. However, before striking such a deal, you should calculate whether it is profitable enough for you. If you think that mining is too risky for you, you can also contribute by writing additions to the existing Bitcoin code, creating your own applications, or simply promoting the project. Bitcoin is a community-driven project, meaning that everyone is welcome to learn and contribute to the network in every possible way.